Just over a week ago, I saw this photo retweeted by Gerald Butts, who happens to be a senior advisor to Justin Trudeau (the Leader of the Liberal Party of Canada). As I’ve spent most of my adult life in the US, I’m used to hearing and writing (here, here, and here) about some of the sobering statistics in that country (approximately 50 million American live in poverty — right now!) As a result, I thought it’d be enlightening to take a closer look at some of the inequalities in Canada. This graph seemed like a good place to start. For instance, I had no idea just how large the disparity was between the richest 20% and poorest 20%, with regard to food and shelter. Looking at the numbers, we can see that the poorest 20% spend approximately 56% (!) of their income on food and shelter. Fifty-six percent! While the richest 20% spend just 32%. I chose these categories because of Maslow’s Hierarchy of Needs. Food and shelter are some of the most basic needs we have and if the poorest 20% has to spend so much of their income on — essentially — surviving, it’s going to make it that much harder to “climb the economic ladder.” Of course, some might say it’s misleading to look at the numbers in aggregate like this. With that being said, this holiday season, I hope you’ll remember this graph when you’re out at holiday parties and issues of politics and/or charities arise. It may add an important layer of perspective to the conversation. I happened to be reading through some of my old posts and noticed that I was going to write a post after I’d finished reading Plutocrats. I guess somewhere along the way it got removed from my to do list. I did write something that came to me while reading the book about looking down our noses, but nothing really about the book after that. I think the author, Chrystia Freeland, did a really good job of bringing the issues to light and explaining them in ways that were accessible. It’s been more than a few months since I read it, a couple of the main points stuck with me. 1. It’s not just the wealthy that control the global economy, but the uber-wealthy. Meaning, it’s not the 1% that are controlling the economy and affecting the 99% (as was the main message from Occupy Wall Street), but it’s the 0.1% who control the economy and affect the 99.9%. This may seem like splitting hairs, but Freeland offers compelling data that shows even the “wealthy” (i.e. the 1%) look like small potatoes next to the 0.1%. 2. The wealth gained by these folks wasn’t necessarily from unsightly means. I don’t know remember if she says unethical, but some may consider it unethical. She makes the case that the uber-wealthy got that way — and continue to stay that way — because they’ve manipulated the market to funnel the wealth in their direction. She also does a little bit of debunking of the “trickle-down” economics perspective. Overall, like I’ve said before, it’s a book that’s certainly worth reading. Something that I find fascinating — Freeland was (as of a few days ago) a Managing Director and Editor of Consumer News at Thomson Reuters. As you learn from the book, this position allowed her to cultivate the contacts with people in high places to make the book that much more compelling (with stories and anecdotes). Anyway, like I said, she had this position. She recently left it. Why? She’s running for a seat in Parliament. The Canadian Parliament (she is Canadian). One of the most storied politicians in Canada in recent history (Bob Rae) left his seat in Toronto Centre to become the chief negotiator for the James Bay area First Nations in negotiations with the provincial government. This vacated his seat and as a result, they’ll be a by-election in the Fall (date not set, yet). 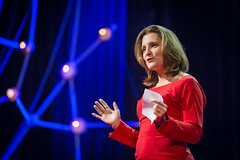 Freeland has met with some of the Liberal Party of Canada leaders and decided to seek the seat. I don’t know if she’ll win the seat (she hasn’t even won the right to represent the Liberal Party just yet), but if she does, I wouldn’t be surprised to see her become part of the “brass” very quickly. In fact, if Justin Trudeau and the Liberals can win enough seats to form a minority or majority government, I wouldn’t be surprised to see Freeland become a Cabinet Minister or at the very least, a senior advisor. Of course, the Federal election isn’t until 2015, but it’s certainly something to think about.